LG's new line of Google TVs packs a punch when it comes to features. The normal Smart TV platform is in place and supplemented with Google TV options that take everything even further. The 50GA6400 has a dual core processor to power everything from menu navigation to surfing the internet. An important thing to consider when many previous smart TVs crawled when it came to loading apps. Picture quality is at it's best here too. The TruPicture XD Engine ensures fast image processing, true to life colors, and deep contrast. Picture quality on the 50GA6400 is very strong for a mid tier LED TV. The bright LED backlights push a lot of light through the panel to create bright and clear pictures. Excellent light flow-through is one of the highlights of this TV. Peak whites are very bright as well. Colors are another strong point as they are presented in a very natural way after dialing in a good calibration. Color rendition isn't over saturated as we have seen on a lot of current generation LED TVs. Black levels and dark shadow detail are where the GA6400 does fall short. Blacks don't measure up to the levels of a decent plasma or an upper tier level TV and dark shadow detail leaves a bit to be desired. This TV produces an excellent overall picture when viewed from front and center. Most LED TVs suffer in this arena and the LG 50GA6400 is no different. It is not a major offender in its defense. We have seen far worse. Color and contrast begin to degrade at about the 25 degrees of center mark. This applies to horizontal and vertical viewing angles alike. Take note of this in case this TV is going to be wall mounted or placed in a room where front and center viewing is hard to achieve. This is an important feature to keep track of. Why? Because this will have to be turned on or off depending on the content being watched. It's a good idea to enable the feature for live sports programming to take full advantage of the 120Hz panel to smooth out the fast action. Film based content and TV programming are best with this setting disabled. Disabling this feature gets rid negative by-products like the “soap opera” effect and reduced natural background blur. We found that the User setting with De-Judder at 0 and De-Blur at 10 produces a great middle ground between the two. In the end, it is important to try out all the different ways to see which you like the best. We have been very impressed with the passive 3D technology from LG this year. I would go as far as saying I even prefer it. The picture remains as bright and clear as Full HD 2D images (even though there is a reduction in resolution due to the tech). Try to get an active 3D TV to do that. The perception of depth is also very strong. The glasses are cheap, comfortable, and light. Unfortunately, we couldn't really test the streaming 3D content through the TVs Smart menu very well due to lack of processor power in the TV. But with 3D Blu-ray content the TV displayed a great amount of depth, rich colors, and good contrast. 4 pairs of glasses are included in the box. This is a great TV for 3D lovers. 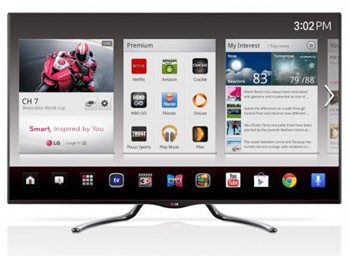 It has the standard Smart TV feature set that is included in most of LG's TVs and Google TV as well. Those two things alone mean it is a feature packed television. Google TV means it will play a little nicer with the internet, as well has having a wider choice of apps (Google Play app store). The already excellent voice features are expanded even further with the addition of Android apps, Google Chrome's ability to scour the internet, and a connection to live TV programming. LG's Google TVs also receive a QWERTY Magic Remote to improve the functionality. One of the nicest features is the cross platform functionality thanks to Google. You must sign in to a Google account to take advantage of any of these features. (This is an upside or a downside depending on your stance on Google's privacy policies). An example is browsing and downloading apps for your TV through a tablet or smartphone that can access the Google Play store. This is a great addition that aims to fully integrate the TV with all of your smart gadgets. Smart TV made a lot of progress in 2012. From what we have seen, we thought LG has been a pretty solid contender. Mix a well established platform with power of Google TV to the 50GA6400 and the possibilities are endless. An updated Home Dashboard includes apps like HBO GO, Youtube, and many other choices to bring you the best content at any moment. LG also included a very cool feature that will make the day of any gamer. OnLive, a streaming gaming service, is installed out of the box granting access to a large library of games. The days of the dedicated gaming console just might be numbered. It's a great app and it's nice to see LG incorporating it into their TVs. See the following page for a full review of LG's Smart TV Platform. This is the side of the Google TV magic remote that will probably get the most use. Notice the easy to access mic button on top right of the remote. The placement makes it a breeze to activate the new voice recognition features. Included with the GA6400 is the new version of LG's innovative Magic QWERTY Remote. It is a motion control remote that we think is one of the best ways out there right now to control a Smart TV. The point and click operation makes this one of the fastest navigation systems on any TV on the market. What it boils down to is a much more enjoyable experience when it comes to surfing the internet and looking through your library of apps. Aside from the QWERTY keyboard, LG has implemented a surprisingly useful voice recognition feature. These additions will further the usability of the remote by making searches by simply saying what you are looking for. The feature enables voice controls for a user to change channels, look for a certain genre of movie, or find a specific show available on the Google TV platform. The QWERTY side of the Google TV magic remote has keys that aren't too small for your fingers. LG has really hit a home run with their built in speakers this year. As far as on-board speakers, they are the best you are going to find. The GA6400 doesn't has the 2.1 speaker configuration found on the LA6900, so the low end of the sound range isn't going to be as deep. This doesn't keep the GA6400 from having a great sound. The volume is plenty loud as well and doesn't have a problem filling the room. Our preferred sound setting is the Cinema mode with Clear Voice II enabled and set to 3. The LG50GA6400 lacks the Cinema Screen design that is associated with a lot of high end LG TVs. The most noticeable difference is the bezel. It is a little wider so you don't get the floating image illusion. The 2 armed dark chrome stand is a refreshing change from the typical U-shaped stand found on LG's TVs. The LG50GA6400 provides strong pricing for competing TVs. For slightly less money the LG provides excellent passive 3D, a fully fleshed out smart TV platform with Google extras, and a QWERTY Magic Remote that provides the best navigation experience. The Samsung UN50F6400 and the Panasonic TC-L50ET60. TV without stand (WxHxD): 44.76" x 26.26" x 1.46"
TV with stand: 44.76" x 29.2" x 12.83"